(1June2011)This issue will complete a short series on how I take a stab at determining sail area. The 1 June issue will with luck cover the Rend Lake Messabout. Hajo Smulder shown here in the Florida 120 with a somewhat rare Mixer2. Nice job! 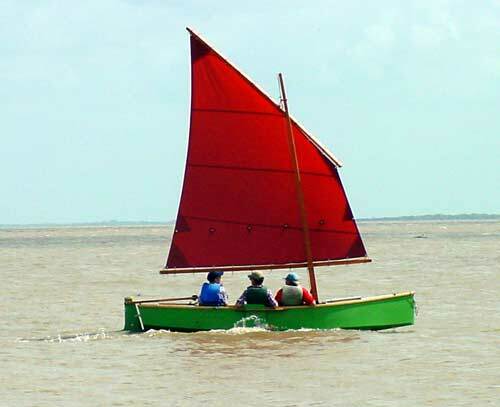 The main forces on the boat are the basic weight, the buoyancy which is equal and opposite to that weight, the force on the sail, and the force on the underwater fin which is assumed equal and opposite to the sail force. All is in balance and the boat is steady. Although the forces are equal and opposite here there is another set of equal and opposites here in that he torque formed by the weight/buoyancy forces, separated by the "righting arm", with be equal and opposite to the torqe formed by the sail/fin forces which are separated by the distance H.
So to get a stab at the sail area required for a design the designer has to first know or guess at the weight, the righting arm, and the sail/fin distance H.
Weight is not that easy to guess at especially considering that it can change with the boat's loading, but after a while you get the hang of it. It can be pretty nebulous as nobody ever weighs a boat or themselves. The pieces of the puzzle are falling into place. So far the actual sail rig you choose hasn't really figured into anything except that you might have guessed at the weight of the rig when you took a stab at the weight and center of gravity. But now you will need a sketch of your proposed rig in order to guess at H, the distance from the sail center to the fin center. Notice I say "guess" and it brings up the idea that design is very much an interative process. You first "assume" a sail rig, then you will crank through the numbers with that assumption and in the end check to see the assumption was valid. If it wasn't you make an adjustment and try again. When I worked at the missile factory this was known as "massaging" the design. Anyway, let's assume for the simple example boat that the sail area center was 10' above the fin area center. Now things go quickly. Take the "no ballast" example. Its righting moment curve peaks at about 400 ft-lbs at around 15 degrees. If you divide the 400 by the assumed H of 10 you get 40 pounds. 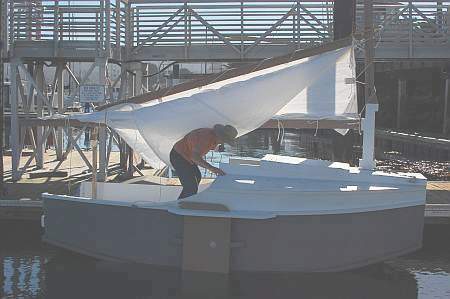 So if the sail force on this hull exceeds 40 pounds the hull will roll past the peak of the curve and keep rolling as long as the sail force is maintained and it suffers a knockdown. This is a simple calculation. Take the "fin ballast" example which has a peak at a little over 800 ft-lbs. 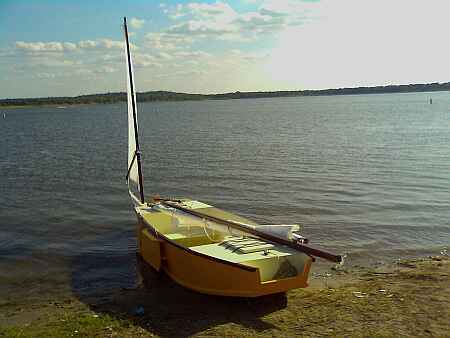 With the same rig it would take 80 pounds of force on the sail to knock the boat over. 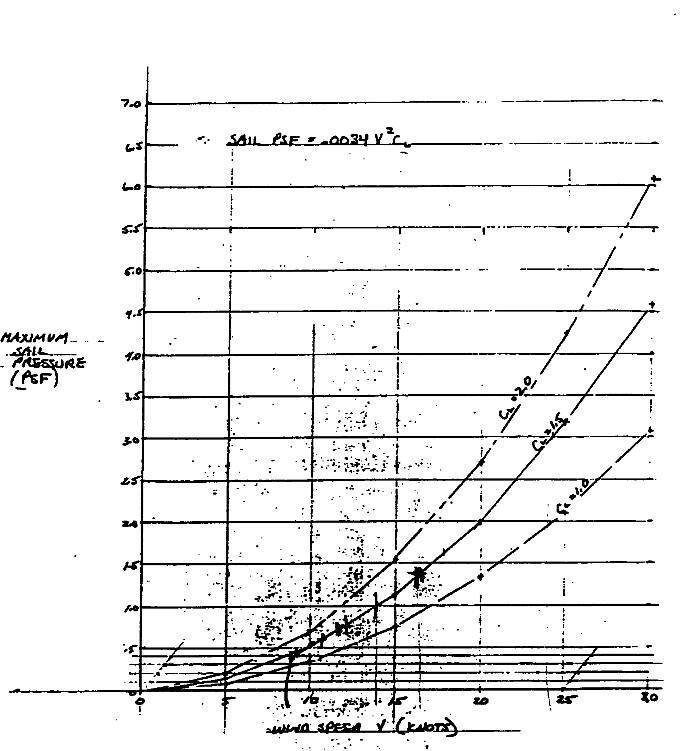 Let's look at this rough curve I gleaned from the writings of the great Polish sail scientist Tony Marchaj. What we have here is a graph showing sail force, in pounds, at different angles to the wind for a 100 sq ft sail in a ten knot wind. There are three lines shown to cover the "efficiencies" shall we say of three grades of sails. Fabulous sails can produce more force per square foot that ordinary sails, at least up until they stall (or luff to a sailor). Sails have been studied in wind tunnels for a long long time, way before Marchaj. They are essentially wings and the values shown here closely agree to curves for real aircraft wings, although the aircraft designer has little interest in how the curve goes way past the stall point. But sailors do care about the sail force past the stall point since this is "downwind" sailing. Anyway, a super sail, state of the art, might have a peak force coefficient of 2 and a crude sail might start to lose efficiency at a coefficient of 1. For a real life example I suggest using the 1.5 line. I think that would be a pretty good sail for the home built boat. But notice that once the peak is reached and the sailor turns downwind all sails have a coefficient of about 1.2. So damn near anything will go well downwind if you can control it - no need for fancy stuff here. If we use our first example of the unballasted boat with H=10, then it takes 40 pounds on the sail to knock the boat down and if the boat had the rig shown on the chart, that happens in a 10 knot wind. Now, I think in this case we have an acceptable answer, that is to say this 100 sq ft rig is about right for the job here. 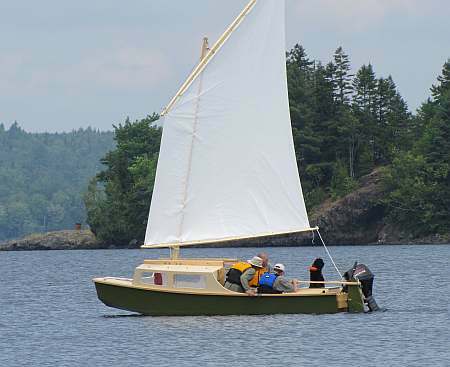 I know ten knots is not a lot of wind but where I live the lakes will start to whitecap then, a visual indication that you are in for a rough sail in this boxy boat. Let's say you weren't thinking in terms of 100 sq ft, maybe because you already have a 60 sq ft sail on hand. In a ten knot wind this sail will produce a maximum of 60/100 x 40 pounds or just 24 pounds of force. 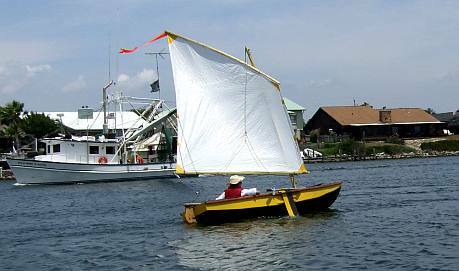 The boat won't capsize in a 10 knot wind because this sail can't produce enough force. But in a stronger wind it can. One thing that makes sailing exciting/dangerous is that the force of the wind increases as the square of its speed. Even the Wright brothers knew that. That means that the ratio used to calculate the new sail force is made by taking the ratio of the new wind to the old, and multiplying it by itself. So if you increase the wind speed by 1.5 to 15 knots, the sail now produces 1.5 x 1.5 = 2.25 times the sail force. And now the 60 sq ft sail will produce 54 pounds of force, more than enough to capsize this example boat. Here is a chart I whipped up to show the wind/force relationship. It shows wind speed vs pressure (in pounds per square foot) for the three sail efficiencies we discussed. One number I like to keep in my back pocket all the time is that a 14 knot wind will produce about 1 pound per square foot force on a normal sail. So in the examples the 100 square foot sail will produce a 100 pound force and the 60 square foot sail will produce 60 pounds. 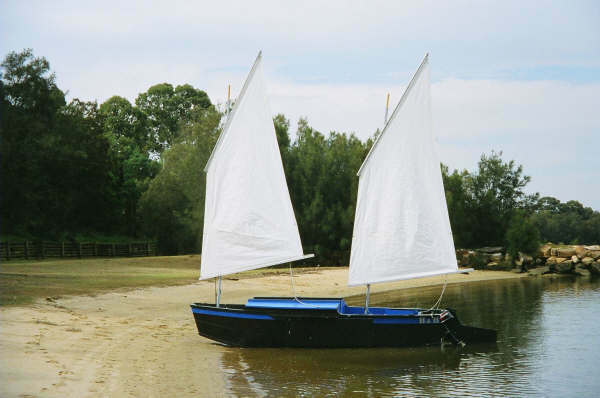 Both in theory will capsize the example boat with no ballast. It doesn't take much of a gust to burst from 10 to 14 knots and thus the exciting/dangerous aspect of sailing in gusting winds. If you don't like the results of your calculations you can massage the design a bit more. 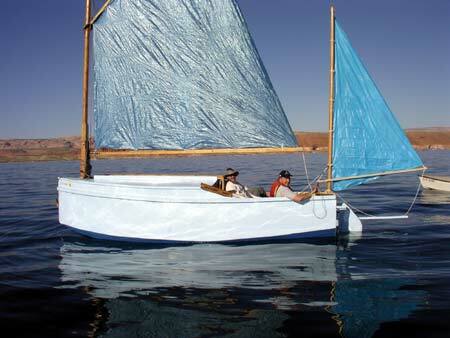 For example if you want to use the 100 square foot sail in 14 knot winds, you can reef it down to 40 square feet! That will usually also bring the sail down lower, reducing the H, so you might juggle the numbers yet another time to account for that. You could also add ballast to lower the cg of the boat which should increase the righting arm and thus increase the hull's stability. 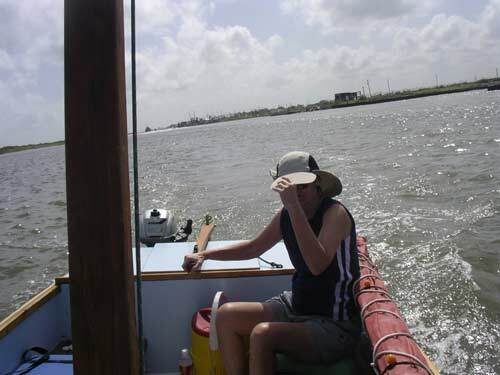 You can also "hike" out which can greatly increase the righting arm, at least a small heel angles and it might be noted is the only way you can sail a boat "flat". I suppose as a last resort you might change the shape of the hull, in particular making it beamier and start anew. Given the way the sail force increase as the square of the wind speed you can see that almost any sail will suit at a certain wind speed. So the 60 square foot sail will be perfect in about a 12 knot wind for our example and the 100 square foot sail perfect in a 9 knot wind. And a lot of us really can't tell the difference between those winds by the feel of our faces. So I think it best to not fret too much about this and not split hairs. But plan ahead with a good reefing scheme. Ladybug is a lot like Woobo which was one of my first designs. There was a Woobo near here for a while. I never got to sail it but was told it would really fly. 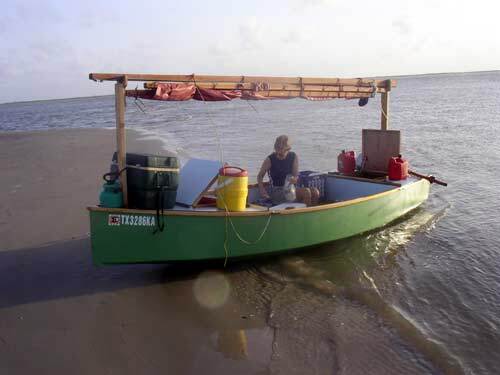 (That boat was made of Lauan plywood from Home Depot which fell to pieces after rainwater filled the boat over the winter.) Ladybug is a bit shorter and wider and deeper and has bench seating, much more suited for older legs. Both boats have a small motor well. The best motor for something like this is the 2hp Johnson/Evinrude which weighs 25 pounds. Even that is overkill since 1hp will push this hull at top speed, anything more just makes bigger waves. Here Sandra Leinweber pushes into a stiff breeze with a 2hp Honda. 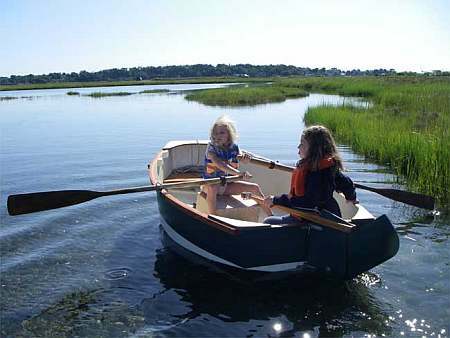 This shape of hull with multichines and a plumb bow seems to be a good all around thing with rough water abilities. I think if there is a problem it is that it has almost no lateral drag and unless the boat has a big skeg or keelson or something like a leeboard or daggerboard or centerboard it would just as soon go sideways as straight. I've given Ladybug a keelson and when using power you should keep the leeboard down just enough so its tip drags the water. Ladybug's hull has the layout I like the best - a 6-1/2' cockpit between two storage/buoyancy boxes. 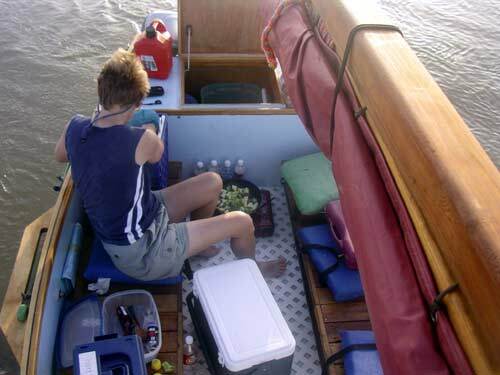 It would be a great solo camping boat. 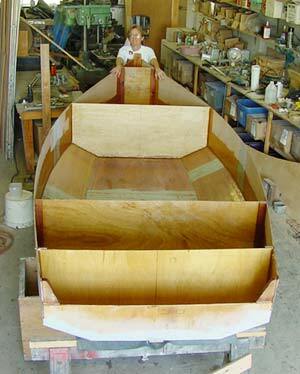 The buoyant wooden spars prevent it from turning turtle. You bring it upright with weight on the lowered leeboard. Then you must climb back on board and a slot in the rudder seems to be the best boarding ladder around, bringing your weight back on board where it least affects the boat. You will have to bail some water. I've kept the same sail as with Woobo, a 75 square foot balanced lugsail. It hoists on a 13' mast with 11' yand and boom. All very low tech built with common materials. Here is the same campout from a distance with the mast folded to support a tent. I'm told the tent is not done yet. 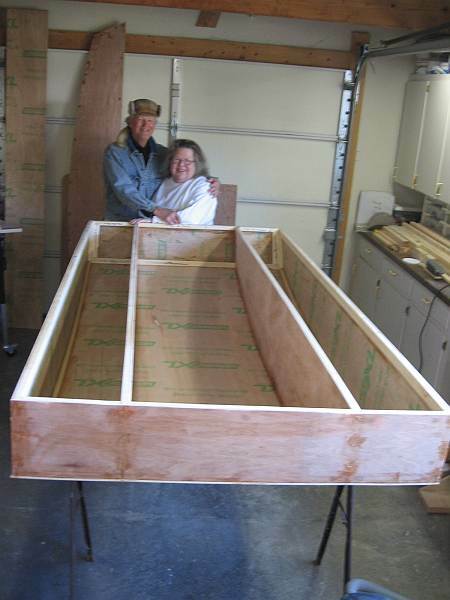 Chuck has modified the bench seats so that his expand towards the center and meet in the center thus making a 6' x 5' sleeping platform. Turns out a small commercial camping tent can be set up on that platform and that is what they are using for now. Ladybug uses taped seam construction. Six sheets of 1/4" plywood, on sheet of 3/8" plywood and two sheets of 1/2' plywood. Plans for Ladybug are $40.